“Let’s go that way,” Hrach says suddenly. This is my first time in Van, one of the biggest cities in the area of Turkey unofficially known as Kurdistan. Van is a university city, very modern, with a bustling air of people getting things done. We head down a side street and soon come across a small museum with an open wrought iron gate. A sign on the door declares it has been closed since 2011, due to the earthquake that devastated Van in October of that year. The earthquake killed 604 people, injured at least 4,152, and left an estimated 60,000 homeless. In front of the museum, laid out in the small garden, are rows and rows of gravestones. 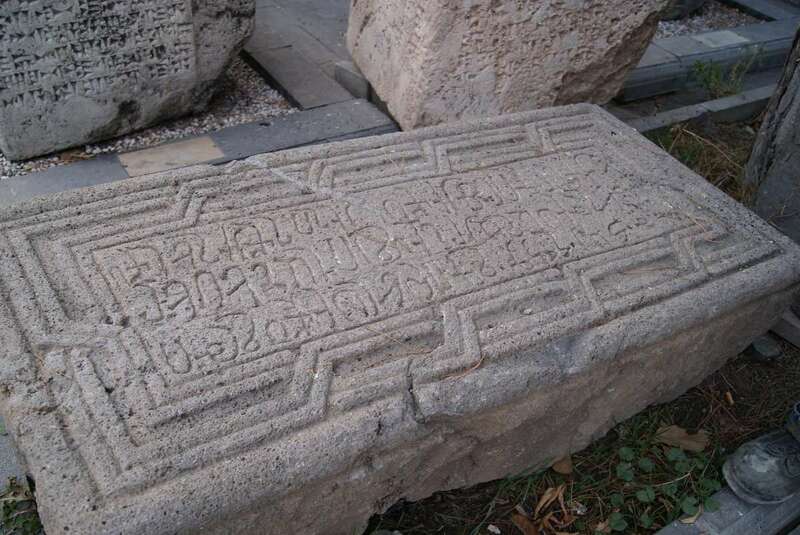 These do not appear to be Turkish or Kurdish gravestones, but are mostly inscribed with Armenian letters. Van was once the center of the Armenian Kingdom of Vaspurakan, and there remained a large Armenian population right up until the Armenian Genocide of 1915. Although Hrach can read the letters easily, he struggles to understand what they say. The words are very old, written in Ancient Armenian. There are other tombstones mingled in with the Armenian ones. Some have Arabic letters – possibly old Turkish, Persian, or Arabic verses from the Quran. Others have an even older cuneiform writing, possibly dating back to when Van was the capital of Urartu in the 9th century BC. We walk among the stones, taking pictures, tracing the letters. 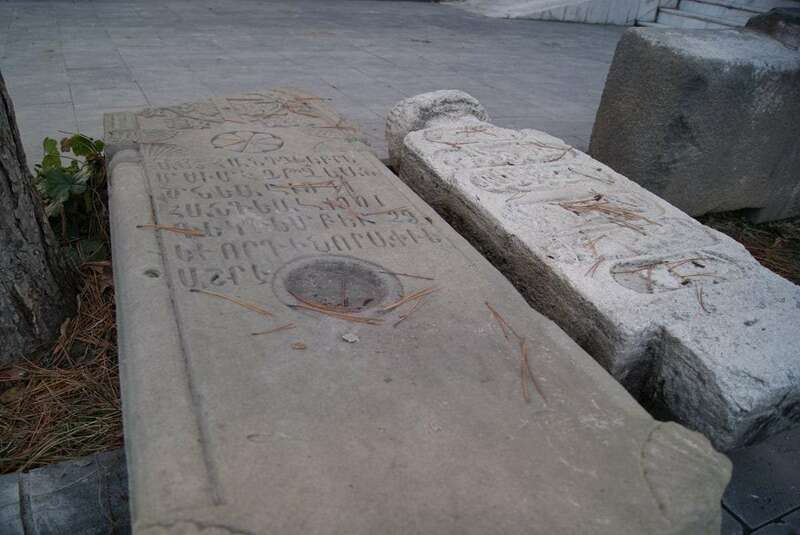 We wonder at the logic behind leaving these stones out in an unguarded place, when there is still such strong anti-Armenian sentiment in Turkey. Our host in Van is the friend of a friend’s friend, and he’s treating us to the famous Van breakfast. Plate after delicious plate is brought by waiters and placed on the long table. Cheeses follow little round dishes of clotted cream, honey, eggs, shiny black and green olives, juicy tomatoes, cucumber, and small cubes of crumbling sweetness. There is the Van cheese, the Kars cheese, and a soft swirly cheese. 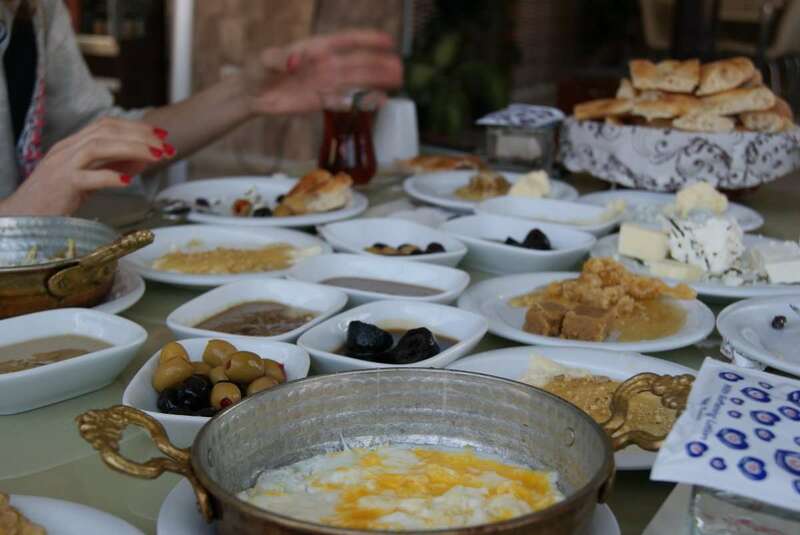 There is a casket of bread, two silver dishes of melemen (Turkish omelette), and tulip glasses of tea, which are replenished frequently. We jostle dishes around the table, rearranging cups and elbows and trying to make space for everything. All of our stomachs are growling, especially our host’s, but it still seems impossible that we could eat this amount of food among ten people, let alone four. I have a feeling that he ordered the waiters to just bring two of everything, without looking at how many things there actually were. Later, I will make my Kurdish friend in England jealous by announcing to him over skype that I have just eaten Van kahvaltı – the Turkish name for breakfast. “You had Van kahvaltısı, and I’m eating… egg.” he will tell me, dropping the plate on his lap in disappointment. Apart from eating the famous breakfast, there’s one more thing we’re determined to do while we’re here. 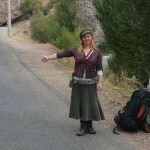 We take a dolmuş away from the city, skirting around the south-east fringe of Lake Van on the road to Gevaş. Lake Van is the largest lake in Turkey, measuring 119km across at its widest point. 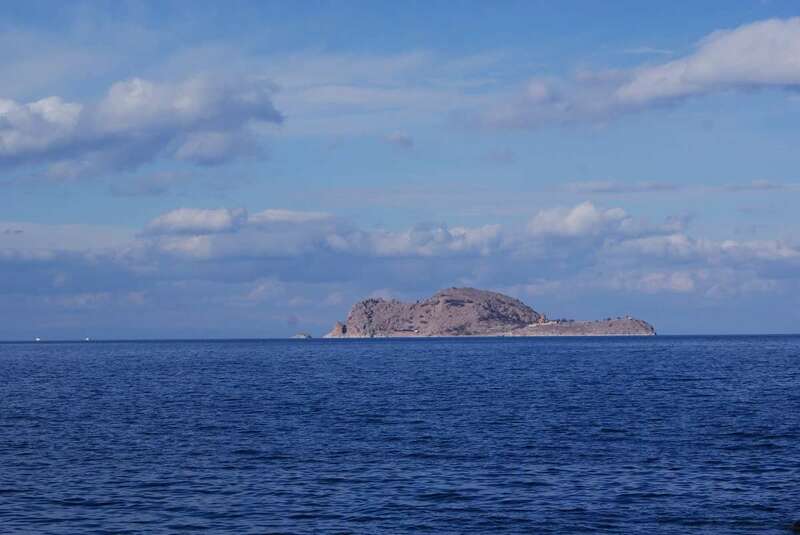 There are four islands in Lake Van and we want to go to Akhtamar, the second largest of these. We arrive at the place where boats ferry tourists to the island. There’s only one problem: it’s winter. There are no tourists. We wander along the short row of boats until we find someone who looks like a sailor. He throws his arms up in the air and gestures around him at the empty harbour. As we feared, there are no tourists. He can take us to the island, but without sharing the fare it’s going to cost at least 120 Turkish Lira ($50). It’s a lot more than the summer price of 10 lira each with a full boat, and it’s far too much for us to spend. There are slightly different versions of the tale, which say that the princess’ lover was a commoner, rather than a prince, or that it was her father who put out the lantern while the lover was swimming towards the island, leaving him to drown. Interestingly, all of the Kurdish people we meet believe that this is a Kurdish legend. I guess in the end, the story is from this place, it belongs to the island. 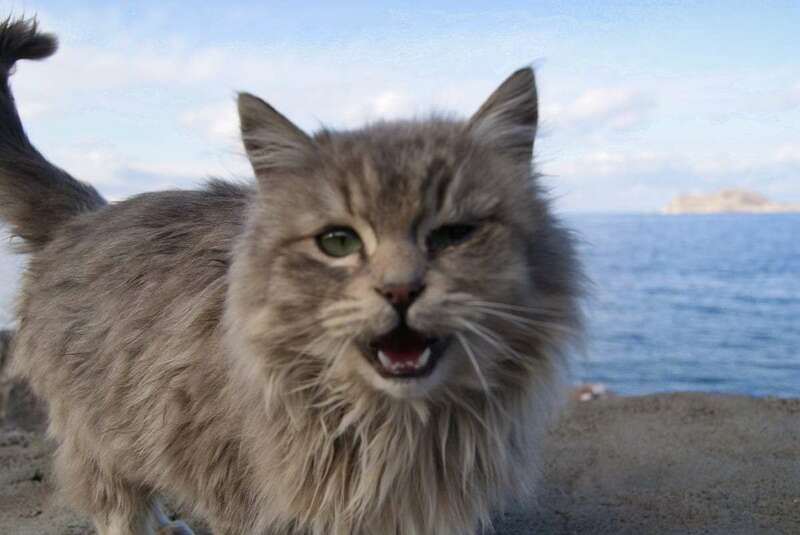 We take pictures of the island, each other, and the island’s guardian cat, hoping for a small group of adventurous people to arrive, wanting to share a passage to the island. 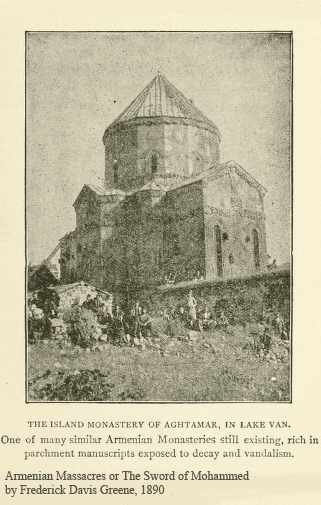 If we could get to there, we would see the 10th century Armenian Holy Cross Cathedral up close. I’m particularly interested to see if there are still visible traces of the bullet holes made by Turkish nationalists, who still deny that the Armenian Genocide ever took place. The Wikipedia article about the island makes for an interesting read.